Back in October 2015, we launched our six-month Libraries Digital Inclusion Action Research Project in partnership with the Leadership for Libraries Taskforce. We awarded funding to 16 library authorities across England to deliver innovative pilots to engage those who are socially excluded and support them to develop basic digital skills. After lots of research, including library visits, we completed the first half of the project, publishing our interim findings report which has given us some great insight into how it's been going so far. The action research project has enabled Library Research Partners to develop a range of innovative delivery models to provide digital skills training for the project’s target audiences. Key elements of delivery models include use of WiFi and MiFi technology; use of tutors, volunteers and library staff; use of online learning resources such as Learn My Way; delivery of sessions in both library and outreach venues; building and working in partnerships (such as with housing associations, Citizens Advice Bureau, and other departments within Local Authorities) and local organisations; and the purchase and use of mobile devices. The availability of WiFi is important for delivering successful digital skills training and engaging with learners, who may have otherwise become disengaged over time. 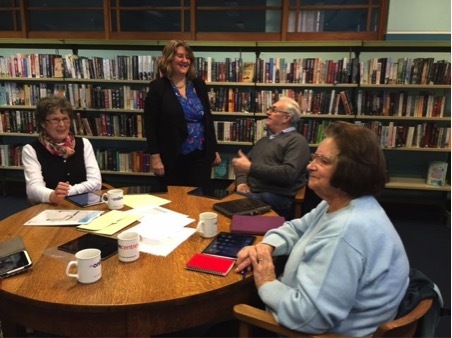 The action research project has increased the awareness of library digital inclusion activities at Local Authority level and the vital work libraries do in relation to supporting the digitally excluded. Tinder Foundation’s CaptureIT tool and it’s online platform, Learn My Way, are both being used by Library Research Partners as tracking mechanisms for the development of learners’ digital skills, which in turn provides management information that libraries can use to demonstrate digital skills delivery and impact. The action research project has enabled library staff to embrace digital and learn new skills. The report also highlights some of the emerging challenges currently facing libraries and how libraries are looking to make their digital inclusion pilots sustainable. The final report - set for launch in June 2016 - will provide important learnings from the project and it is hoped that theyit will help inform future digital inclusion strategies for the library sector. I have been conducting a lot of interviews with library staff and those who are learning from them, and I know that there will be a lot of case studies to include in the final report, proving the impact that the project has had on both library services and learners alike. Libraries play an important role across the UK today, acting as a bridge between local communities and public services. They empower people who are socially and digitally excluded through innovative learning opportunities and I’m sure this will be reflected in the findings for the project’s final report. For further details and to continue conversations, check out Tinder Foundation’s Digital Libraries Hub - a free online resource for library staff, volunteers, heads of service, and anyone interested in digital inclusion, or get chatting on social media using the hashtag #digilibraries. Tinder Foundation is a charity which supports digitally and socially excluded people to improve their lives through digital. They lead a network of 5,000 local community partners, and work with a variety of national organisations to help hundreds of thousands of people every year to use the internet to improve their lives. Together we have helped 1.6 million people to use the internet and to develop basic online skills. Please note, this is a guest blog. Views expressed here do not necessarily represent the views of Libraries Taskforce or the DCMS.